Providing the best products available with professional installation and on site training. With our outdoor surveillance systems, you can leave your ranch or greenhouse and have the peace of mind of knowing you can keep an eye on your property without being physically present. 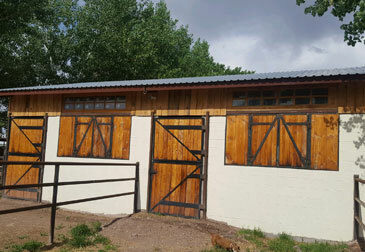 When you have Visual Security install a security system, you will be able to see what’s going on in the pasture, stables and feeding areas. Livestock breeders can view the mothers and when to react to situations as soon as they happen. You will also have to freedom to remotely oversee projects and work being done by your ranch hands. Many companies offer a “cookie cutter” system that have limitations and may not fit with what you, personally, are looking for. We offer surveillance systems to fit your needs. Contact us today to get all your questions answered, and set up your free design and quote. We look forward to working with you soon! Wide selection of cameras available to cover as much area as needed. Distance from ranch house to cameras not a problem. View previously recorded video. Check to see what happened yesterday or last week. Technical support always available by phone. Custom systems and installations available. Full warranty on parts and labor. We provide our valued customers with the best products available and professional installation services. We also offer free site surveys! Contact us today for more information. As a Visual Security client, we promise to provide you with best product and services in the business! Check out our list of frequently asked questions. We offer our services to all types of small businesses in Colorado and Southern Wyoming. Learn more about our products and services today. © 2018 Visual Security LLC . Do Not Copy.